FIG. 1 U.S. Naval Research Laboratory Ga2O3 core/Ag shell nanowire composite drawing and SEM image. In U.S. Patent 7,639,356 (Washington, DC) U.S. Naval Research Laboratory (NRL) scientists Sharka M. Prokes and Orest J Glembocki reveal a new surface enhanced Raman spectroscopy (SERS)-active substrate consisting of dielectric/Ag nanowire composites, which show very enhanced sensitivities, in the parts per billion range. The reason for such high sensitivities can be that the nanowire crossings lead to very large electric field enhancements in large regions around the nanowires, allowing a larger volume of molecules of interest to be detected. Furthermore, the wires can also be dispersed in a liquid, allowing for stand-off sensing applications. 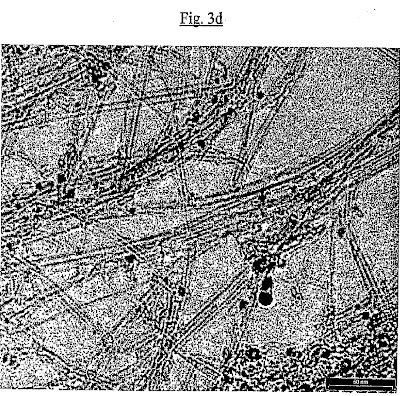 The nanowires can also serve as taggants. 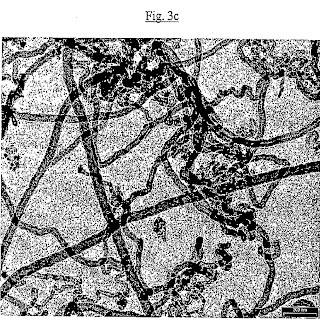 U.S. Patent 7,639,356, awarded to the U.S. Navy, describes metal/wide band gap semiconductor nanowire composites which exhibit significantly enhanced surface enhanced Raman scattering (SERS) and fluorescence (SEF) signal and which can be used for very efficient chemical or biological sensors. In one embodiment, the fabrication technique can be applicable to Ga2O3 semiconductor nanowires and other metal oxide nanowires, with controlled size diameters ranging from about 5 to about 100 nm. The composite can consist of the nanowire core structure, which can be coated with a silver metallic shell on the order of 3-10 nm. An apparatus comprising a substrate and at least two nanowires on the substrate, the nanowires comprising a core and a metal shell, wherein the core is selected from the group consisting of a semiconductor and a dielectric, thereby forming a nanowire-composite to allow plasmon coupling for enhancements of the electric fields and enhancements of the surface enhanced Raman signal (SERS) and enhancements of the chemical or biological specificity and sensitivity. A method of making a SERS-active substrate comprising providing a substrate and affixing a plurality of nanowires on the substrate thereby forming a nano-composite, creating plasmon coupling leading to enhanced electric fields in the vicinity of the nanowires and enhancements of the surface enhanced Raman signal (SERS) and enhancements of the chemical or biological specificity and sensitivity. Raman scattering is often used in the chemical identification of materials. Light scattered from various vibrational modes in a material is red- and blue-shifted by the frequency of the vibrational modes. 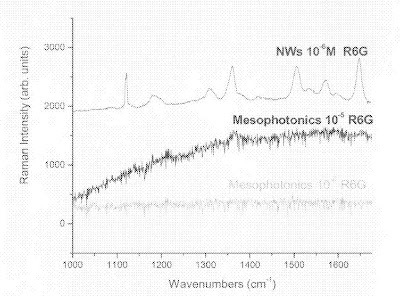 The information that is obtained from Raman scattering is complementary to that of IR spectroscopy, but with the advantage of being performed with visible light. Because the Raman cross-sections of most materials are very small, the intensity of the Raman signal is often 8 orders of magnitude lower than the intensity of the exciting laser. Thus, rapid acquisition of Raman scattering requires the use of intense laser light, limiting the equipment to table top lasers. The situation is even more serious for small amounts of a species adsorbed on a surface of a material. In the surface enhanced Raman scattering (SERS) effect rough metal surfaces (usually Ag) are used to increase the Raman signal of species adsorbed on the metal. Enhancements of up to 8 orders of magnitude have been observed. The SERS enhancement of molecules adsorbed on the roughened metal surface is caused by local electromagnetic fields that are created by the laser excitation of surface plasmons at the metal surface. Significant work has been done in SERS using various metals and geometry for the roughened features, including aggregate films, nano-particles, nano-shells and solid metal nanowire ordered arrays. The two Navy scientists showed that local hot spots in the electric fields produced by localized plasmons excited in nanoparticles can produce large SERS effects. Furthermore, it has been suggested that using nanoparticles of appropriate size and geometry can lead to further enhancements by moving the plasmons absorption frequency close to that of the exciting laser. This adds resonant enhancement to the SERS process, further increasing the Raman signal. FIG. 3 Comparison of SERS signal for Mesophotonics "Klarite" commercial substrate and NRL Ga2O3/Ag nanowire composites. FIG. 4 Schematic diagram showing how crossed nanowires can be used to construct a 3D array that may maximize crossing points, where the SERS enhancement may be greatest. FIG. 5 Dilution of Ga2O3/Ag nanowire composites. 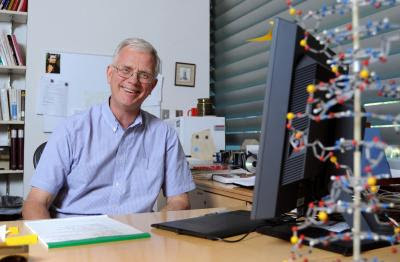 In the current issue of Science, Stuart Lindsay, director of Arizona State University’s Center for Single Molecule Biophysics at the Biodesign Institute, along with his colleagues, demonstrates the potential of a new DNA sequencing method in which a single-stranded ribbon of DNA is threaded through a carbon nanotube. Credit: The Biodesign Institute at Arizona State University. Faster sequencing of DNA holds enormous potential for biology and medicine, particularly for personalized diagnosis and customized treatment based on each individual's genomic makeup. At present however, sequencing technology remains cumbersome and cost prohibitive for most clinical applications, though this may be changing, thanks to a range of innovative new techniques. 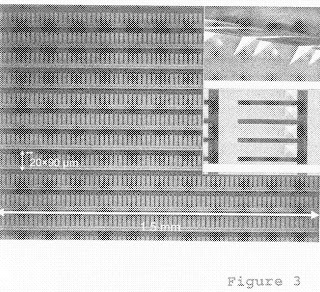 U. S. Patent Application 20090325816 details Northwestern University’s instrument for massively parallel dip pen nano-lithography using two-dimensional pen arrays. The device has a patterning rate between 100,000 to 4 million dots per minute. Patterns can be created with lines and dots as small as 20 nanometers. Substrates can be coated and patterned with, for example, 25 million structures, to 1 billion structures to form devices for use in biosensors, drug discovery, drug delivery and other biochemical applications. Inventors Northwester University Dr. Chad A. Mirkin (Director of the International Institute for Nanotechnology), with Peng Sun, Yuhuang Wang and Steven Lenhert developed instruments for massive parallel printing of structures and nanostructures, including lipids, at high speed with high resolution and high quality using two dimensional arrays comprising cantilevers and tip-based transfer of material to a surface. Micro- and nanoscopic heterogeneities, such as lipid rafts and focal adhesions, are vital to the biological function of lipid bilayer membranes. Lithographically patterned phospholipid membranes can be used as cell-surface models and have been used in several applications, including biochemical sensors, drug screening and delivery, the analysis of cell-cell interactions, and to address fundamental biological questions in membrane trafficking. Northwestern's method allows both high-resolution patterning and parallel deposition of different phospholipid materials over large areas. Massively parallel lithography with two-dimensional pen arrays is suitable for the rapid fabrication and integration of large-scale phospholipid nanostructure libraries on a variety of substrates. The array is designed so only tips touch the surface. This can be accomplished by long tips and bent cantilevers and alignment. The instrument includes: a two-dimensional array of a plurality of cantilevers, wherein the array comprises a plurality of base rows, each base row comprising a plurality of cantilevers, wherein each of the cantilevers comprise tips at the cantilever end away from the base, wherein the number of cantilevers is greater than 250, and wherein the tips have an apex height relative to the cantilever of at least four microns, and a support for the array. Combinatorial arrays and bioarrays can be prepared. The arrays can be manufactured by micromachining methods. FIG. 1. 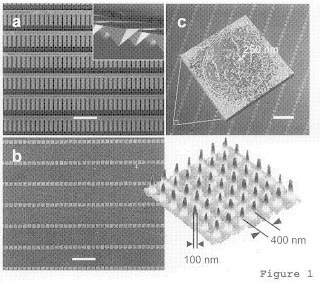 Dip Pen Nanolithography (DPN) patterning with 55,000 AFM cantilevers in parallel: (a) Optical micrograph of part of the 2D array of cantilevers used for patterning. Inset shows an SEM image of the tips. (b) Large area SEM image (left) of part of an 88,000,000 gold dot array (40.times.40 within each block) on an oxidized silicon substrate. A representative AFM topographical image (right) of part of a block. (c) Representative optical micrograph (inset shows AFM image) of .about.55,000 features drawn in the form of the face of the 2005 US five cent coins. The coin bears a picture of Thomas Jefferson, who helped develop the polygraph, a macroscopic letter duplicator that relies on an array of pens. The instruments can be used to control multi-bilayer stacking (FIG. 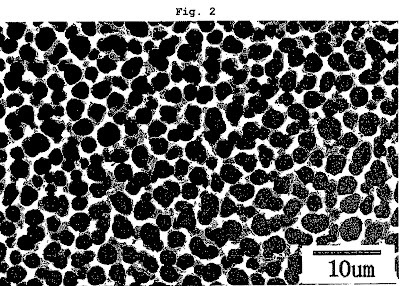 1); phospholipid patterns including fluorophore doping (FIG. 2); parallel writing of multiple inks including for testing membrane fluidity; and generation of fluorescent micrographs. DPN printing makes can use an atomic force microscope tip to directly deposit molecular inks onto a surface, reproducibly allowing line widths below 20 nm in the case of alkanethiols on gold. FIG. 2. 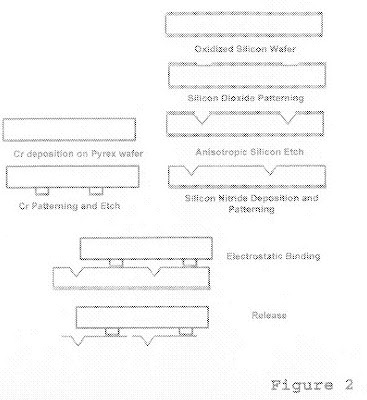 A schematic diagram of the fabrication process for 2D cantilever arrays. The ability for DPN to operate under ambient conditions makes it particularly well suited to the fabrication of biomolecular arrays. This unique capability has been demonstrated by the fabrication of DNA and protein arrays with sub-100-nm lateral resolution. The fabrication of small spot sizes locally concentrates the analyte, which enables the detection of very low bulk analyte concentrations. Importantly, DPN has an advantage over other types of lithography in that many different chemical functionalities can be integrated onto a single surface without the risk of feature cross-contamination, as in the previously used indirect methods. 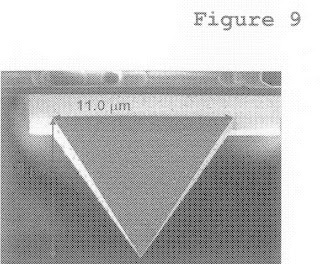 Since the line widths and spot sizes in DPN are independent of the contact force of the microscope tip on the substrate, the technique can be readily carried out in parallel with arrays of cantilevers over centimeter length scales. FIG. 3. Optical micrograph of part of a 2D 55,000 pen array. Insets are SEM images of the pen array from side view (top), and top view (bottom), respectively. FIG. 9. SEM image of single dip pen pyramidal tip, where the measured tip apex height is 8.8 microns and the base is 11.0 microns. FIG. 10. 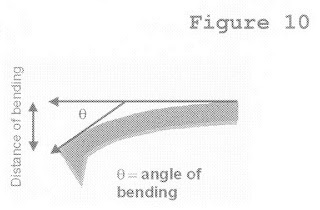 Illustrating measurement of angle of cantilever bending and distance of cantilever bending. Professor Mirkin is a chemist and a world renowned nanoscience expert, who is known for his development of nanoparticle-based biodetection schemes, the invention of Dip-Pen Nanolithography, and contributions to supramolecular chemistry, nanoelectronics, and nanooptics. He is the author of over 400 manuscripts and over 360 patents and applications, and the founder of three companies, Nanosphere, NanoInk, and Aurasense which are commercializing nanotechnology applications in the life science and semiconductor industries. NanoInk is commercializing Dip Pin Nanolithography. 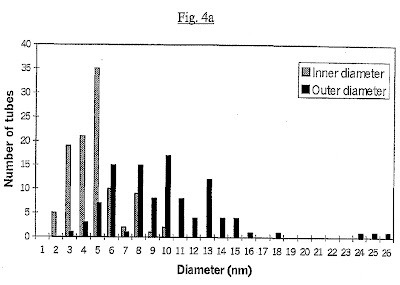 Micron Technology, Inc. (Boise, ID) inventor Leonard Forbes discloses details of nanocrystal write once read only memory for archival storage in U.S. Patent 7,639,528. Forbes developed structures and methods for write once read only memory employing charge trapping. The write once read only memory cell includes a metal oxide semiconductor field effect transistor (MOSFET) in a substrate. The MOSFET has a first source/drain region, a second source/drain region, and a channel region between the first and the second source/drain regions. 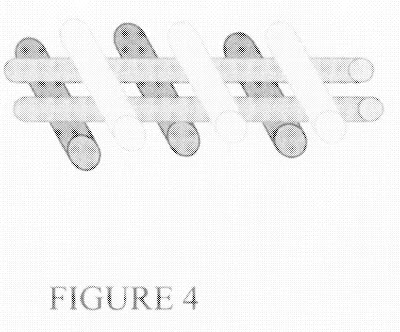 A gate insulator is formed opposing the channel region. The novel programmed MOSFETs conduct significantly less current than conventional MOSFETs, particularly at low drain voltages. Electrons will remain trapped in the number of high work function nanoparticles, or nanocrystals, within the gate oxide gate unless negative gate voltages are applied. The electrons will not be removed from the number of high work function nanoparticles, or nanocrystals, within a gate oxide when positive or zero gate voltages are applied. Erasure can be accomplished by applying negative gate voltages and/or increasing the temperature with negative gate bias applied to cause the trapped electrons to be re-emitted back into the silicon channel of the MOSFET. The gate insulator includes a number of high work function nanoparticles. A gate is formed on the gate insulator. A plug is coupled to the first source/drain region and couples the first source/drain region to an array plate. A transmission line is coupled to the second source/drain region. The MOSFET is a programmed MOSFET having a charge trapped in the number of high work function nanoparticles in the gate insulator adjacent to the first source/drain region. Applications containing the novel memory cell include electronic systems for use in memory modules, device drivers, power modules, communication modems, processor modules, and application-specific modules, and may include multilayer, multichip modules. Such circuitry can further be a subcomponent of a variety of electronic systems, such as a clock, a television, a cell phone, a personal computer, an automobile, an industrial control system, an aircraft, and others. The MOSFETs can be programmed by operation in the reverse direction and utilizing avalanche hot electron injection to trap electrons in a number of high work function nanoparticles, or nanocrystals, within a gate oxide of the MOSFET. When the programmed MOSFET is subsequently operated in the forward direction the electrons, trapped in the number of high work function nanoparticles, or nanocrystals, within the gate oxide, are near the source and cause the channel to have two different threshold voltage regions. The key high work function nanoparticles include nanocrystals selected from the group of p-type nanocrystals of silicon germanium for gates, p-type nanocrystals gates of other semiconductors as silicon carbide, silicon oxycarbide, gallium nitride (GaN), and aluminum gallium nitride (AlGaN). The nanocrystals are isolated from one another and not in conductive contact. In still other embodiments, the number of high work function nanoparticles include heavily doped p-type polysilicon floating and isolated nanocrystals with a vacuum work function of 5.3 eV. New Danish nano research gives important insights in nerve cell communication that will help the fight against nerve pain following amputation and diabetes. Researchers from the Nano-Science Center and the Department of Neuroscience and Pharmacology at the University of Copenhagen have with nanotechnology techniques studied the way proteins recognize the small membrane vesicles that transmit signalling molecules from one nerve cell to another. The research has been published in the respected journal EMBO Journal. Communication between nerve cells is vital for our bodies to function. Part of this communication happens through vesicles containing signalling molecules called neurotransmitters. The vesicle fuses with the nerve cell membrane; the neurotransmitters are released and quickly recorded by the next nerve cell. It is crucial that new vesicles constantly are produced for the nerve cell communication continuously to take place. If parts of this communication do not work, it leads to nerve pain like phantom pain following amputation. In patients with nerve pain, part of the pathological picture is a defect in a protein domain called BAR. Danish scientists studied how BAR binds to small membrane vesicles of different size. We expect that the new knowledge can be used to combat nerve pain in the future, explains Associate Professor Dimitrios Stamou, Bio-Nanotechnology Laboratory, Nano-Science Center and the Department of Neuroscience and Pharmacology. Dimitrios Stamou has led the work. The researchers have used nanotechnology techniques, which give them the unique opportunity to study the binding of proteins to individual vesicles. Earlier studies have been performed in solutions where you measure a large number of vesicles and proteins at a time. This gives an average value of binding and ”masks out” a large number of important information that can be retrieved by measurements on single vesicles, says Dimitrios Stamou. Confocal microscopy images. Right: Brain-lipid vesicles. Smaller “dots” indicate smaller vesicles. Left: BAR domain protein. The intensity of the dot indicates the amount of BAR bound to the vesicle. The smaller the vesicle, the more curved membrane, and the more binding of BAR. "To our great surprise we find that BAR binds to the membrane vesicles via small cracks in the vesicle membrane. We had expected that BAR bound to the small round membrane vesicles both because of its banana shaped structure, which fits with the shape of the vesicle, and by means of an attraction between “the banana’s” positive surface and vesicle’s negative surface. But instead, it is the hydrophobic part of BAR that is involved in binding," explains Associate Professor Dimitrios Stamou, Bio-Nanotechnology Laboratory, Nano-Science Center and the Department of Neuroscience and Pharmacology. 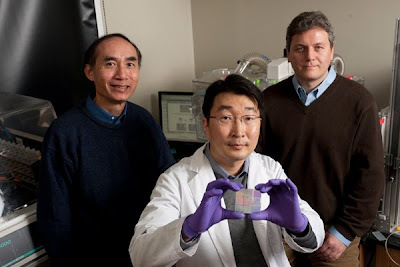 Johns Hopkins researchers developed this chip to culture heart cells that more closely resemble natural cardiac tissue. 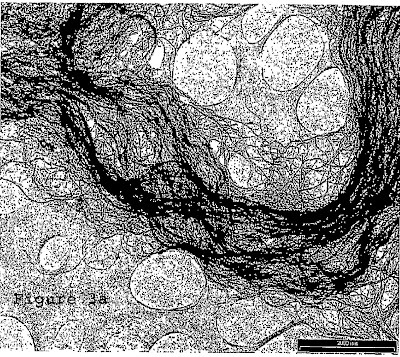 Levchenko and his Korean colleagues, working with Deok-Ho Kim, a biomedical engineering doctoral student in Levchenko’s lab and the lead author of the PNAS article, developed a two-dimensional hydrogel surface simulating the rigidity, size and shape of the fibers found throughout a natural ECM network. This biofriendly surface made of nontoxic polyethylene glycol displays an array of long ridges resembling the folded pattern of corrugated cardboard. The ridged hydrogel sits upon a glass slide about the size of a U.S. dollar coin. The team made a variety of chips with ridge widths spanning from 150 to 800 nanometers, groove widths ranging from 50 to 800 nanometers and ridge heights varying from 200 to 500 nanometers. This allowed researchers to control the surface texture over more than five orders of magnitude of length. Iranian chemists made a modified glassy carbon electrode with a functionalized carbon nanotube which is able to electrochemically measure the cysteamine present in biological specimens. Nanotechnology has opened new horizons for the use of nanoparticles and carbon nanotubes in analytical chemistry and detection of some biological and chemical compounds. One of the interesting applications of nanoparticles and carbon nanotubes is to facilitate electron transfer reactions. "Since some of amino acids are sulfuric compounds, their electrochemical oxidation on the surface of common electrodes are very slow. As a consequence, we can't detect them on the current electrodes surfaces and measure," Fereshteh Chekin, one of researchers told the news service of Iran Nanotechnology Initiative Council (INIC). To overcome this limitation, different mediums were utilized and modified chemical electrodes were made. In this regard, the researchers fabricated modified glassy carbon electrode by means of functionalized carbon nanotube to electrochemically measure cysteamine. The stabilization of electron transfer mediums like carbon nanotubes and naphthoquinone compounds on electrode beds was characterized by SEM images. This naphthoquinone functionalized modified electrode was used as an electrochemical sensor in voltammetric measurement of cysteamine. "The present study is a fundamental research which could be used in the measurement of cysteamine present in biological specimens at clinical laboratories and research centers", Chekin added. The present study is published at Journal of Electroanalytical Chemistry, volume 633, pages 187 to 192, 2009. Korean researchers at the Inha-Industry Partnership Institute have developed a new weapon for the war on cancer: silicon nanobombs. The smart nanobombs kill cancer cells but leave normal cells unharmed. FIG. 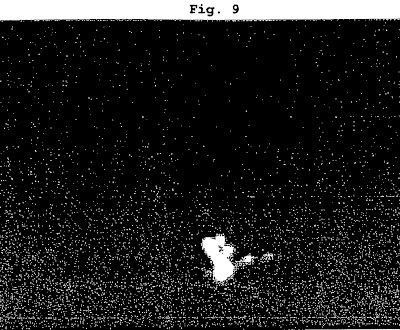 10 from Inha-Industry Partnership Institute’s U.S Patent Application 20090326520 is a capture image of a cancer killing silicon nanobomb explosion occurring upon the irradiation of NIR light onto porous silicon nanobombs with sulfur entrapped within its pores. Silicon nanobombs have been successfully used to kill breast cancer cells. Inha-Industry Partnership Institute (Incheon, KR) researchers Chongmu Lee, Hohyeong Kim and Chanseok Hong developed a method for treating cancer using a porous silicon nanobomb. The porous silicon nanobomb can be exploded by NIR light irradiation at a low intensity to selectively destroy cancer cells. 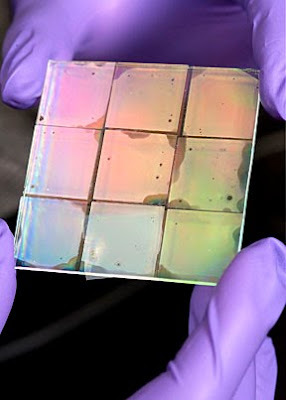 Also, porous silicon itself shows good biocompatibility and biodegradability. According to U.S. Patent Application 20090326520, the silicon nanobomb can be used as an efficient method for treating cancer without the accumulation of toxic side effects. The porous silicon nanobomb of the present invention can be heated by NIR light with an irradiation intensity of from 100 to 400 mW/cm2, which is only about one hundredth of that required for heating nanoshells, that is, 35 W/ cm2. For carbon nanotubes, the irradiation intensity of NIR light amounts to 1 to 4 W/cm2 Therefore, the nanobombs are useful in the treatment of cancer without damaging normal cells, in contrast to nanoshells and carbon nanotubes. Thermotherapy is a minimally invasive cancer treatment technique that can replace invasive surgical treatment. Entailing a relatively simple operation in addition to minimal invasiveness, thermotherapy makes possible a short recovery time. Also, thermotherapy is a type of physical therapy with fewer limitations than chemotherapy and is typically used in combination with both of the invasive therapies. In addition, it allows repeated treatments without the accumulation of toxic side effects. Thermotherapy (or thermal ablation therapy) includes laser-induced thermotherapy, microwave and radiofrequency (RF) ablation, magnetic thermal ablation, and focused ultrasound. Most of them, however, have shortcomings in that the treatment takes a long period of time and that its lesion boundaries are not well defined. 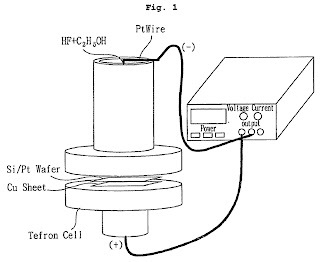 Alternatively proposed was magnetic thermotherapy based on using alternating current to heat oxide nanoparticles in tumor cells. Although disadvantageous in that it requires a large quantity of iron for sufficient thermal effects, this magnetic thermotherapy has an advantage over the other thermotherapies in that it can selectively heat only the cells filled with oxides of iron. Inha-Industry Partnership Institute’s method for treating cancer uses biocompatible and biodegradable porous silicon nanobombs which can generate heat sufficient to selectively kill cancer cells upon exposure to NIR light at a low intensity, with accompaniment of neither toxicity to normal cells nor side effects. FIG. 2 is an scanning electron microscope (SEM) image showing nano-porous silicon in a plan view. FIG. 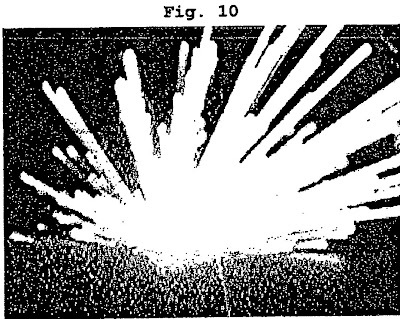 9 is a captured image of an explosion occurring upon the irradiation of NIR light onto the porous silicon bombs with NaClO4.1H2O entrapped within the pores thereof. As seen in FIGS. 9 and 10, the bombs of sulfur (FIG. 10) were exploded on a larger scale than were the bombs of NaClO4.1H2O (FIG. 9). FIG. 12 is that of after exposure to NIR light for 20 min. A drama is seen between the cells of FIGS. 12 and 11. Upon NIR exposure in the presence of the PSi suspension, the cells seemed to be blown up and burnt black. Explosion was observed to occur inside the cell clusters as inferred from the morphology of dead cells. Also, the bubbles showed that the cells were blown up in the explosion. 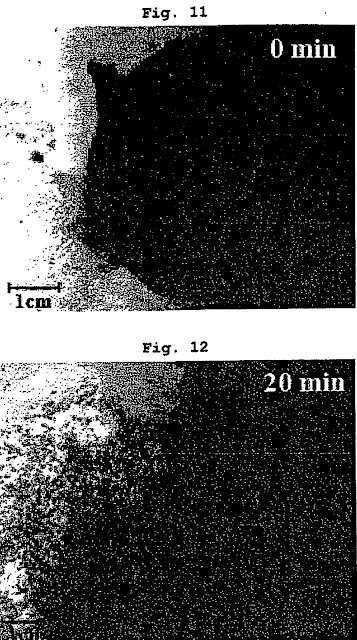 Bubbles found around dead cells were evidence of the vigorous boiling of the NaCl solution within porous silicon particles, implying that the explosion of porous silicon particles resulted from the temperature elevation of the NaCl solution localized within the silicon particles to exceed the boiling point. 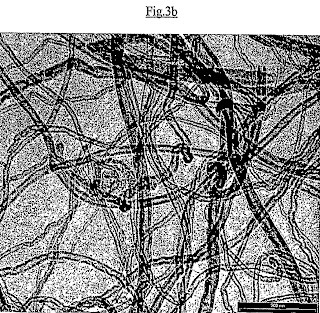 Facultes Universitaires Notre-Dame De La Paix (Namur, BE) researchers detail a number of hydroxide and carbonate-based catalyst supports used for manufacturing multiwall carbon nanotubes (MWNT) and single wall carbon nanotubes (SWNT) in U.S. Patent Application 20090325788. The inventors claim the new catalyst supports do not produce large amounts of soot and amorphous carbon along with the carbon nanotubes as do many common catalyst supports now used. Inventors Janos B. Nagy, Narasimaiah Nagaraju, Isabelle Willems and Antonio Fonseca prepared carbon nanotubes by the catalytic decomposition of hydrocarbons using a technique called CCVD (Catalytic Carbon Vapor Deposition), carried out in the presence of catalysts to produce both MWNTs and SWNTs. Soot and encapsulated metal nanoparticles are the other by-products. The hydrocarbon can be acetylene, ethylene, butane, propane, ethane, methane or any other gaseous or volatile carbon containing compound. The catalyst, a transition metal, is generally, either pure or dispersed on a support. The presence of a support for the catalyst affects the activity of the catalysts tremendously in the formation of carbon nanotubes. The selectivity of the catalyst for the production of nanotubes also depends on the type of catalyst support interaction. The most common supports used to prepare supported catalyst for carbon nanotubes production are oxides i.e., silica, alumina, silica-alumina mixtures, magnesium oxide, calcium oxide, titanium oxide, cerium oxide, zeolites, spinels and graphite. The use of porous materials (i.e., silica, alumina, zeolites, etc.) as supports for catalysts, contaminates the carbon nanotubes produced thereon with a large amount of soot and amorphous carbon, while dissolving the support during the purification of the carbon nanotubes. The Notre-Dame De La Paix hydroxide and carbonate-based catalyst supports do not present the contamination drawbacks of the catalyst supports of the state of the art. Spreading manually or mechanically an appropriate amount of supported catalyst on a quartz boat to be used as bed for the supported catalyst in the fixed bed reactor. In the case of a moving bed reactor, the supported catalyst is spread continuously or by intermittence mechanically or manually on the moving bed of the reactor. The reactor, containing the supported catalyst, is either kept initially at the appropriate constant reaction temperature (400-1200.degree. C.), or it is heated to the reaction temperature for an appropriate time of the reaction. Inert or reactant gas(es) can be passed over the supported catalyst during that step. The pure or diluted hydrocarbon is passed over the supported catalyst at a predetermined temperature. Carbon nanotubes are grown on the supported catalyst as a result of the CCVD reaction. Diluted hydrocarbons are obtained by mixing at least one hydrocarbon with other gases such as nitrogen, argon, helium, hydrogen, CO, etc. Stirring the crude nanotubes in a concentrated basic solution, preferably a concentrated NaOH solution, at a temperature in between 100-250.degree. C. Recovering the solid product by filtration and preferably washing it until a neutral pH is obtained. This first step is not necessary if the catalyst support contains only Mg and/or Ca derivatives. Stirring the product in a concentrated acidic solution, preferably a concentrated HCl solution, at a temperature in between 0-120.degree. C.
Recovering the solid product (purified carbon nanotubes) by filtration and preferably washing until a neutral pH is obtained. Finally purified carbon nanotubes are dried by air flow on a filter or by a rotary evaporator or by the use of a vacuum pump or by the use of an oven or a furnace. Preferably, the oven or furnace is heated at temperatures varying from 30.degree. C. to 400.degree. C. in air or from 30.degree. C. to 1200.degree. C. under vacuum or inert atmosphere. FIG. 3a represents a low magnification Transmission Electron Microscopy (TEM) image of as made MWNTs, synthesized by acetylene decomposition at 700.degree. C. in a continuous reaction of 60 min, on the supported catalyst SCA2. The catalyst was activated by preheating 10 min in N2 flow. FIG. 3b represents a higher magnification TEM image of MWNTs synthesized as in FIG. 3a. FIG. 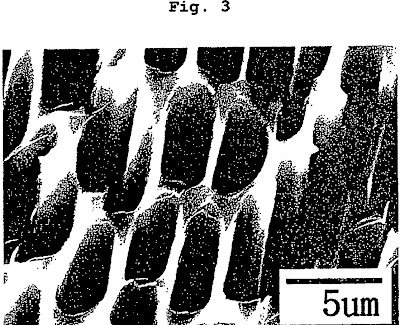 3c represents a low magnification TEM image of as made carbon fibers, synthesized by acetylene decomposition at 700.degree. C. in a continuous reaction of 60 min, on the supported catalyst SCA63. The catalyst was activated by preheating 10 min in N2 flow. FIG. 3d represents a low magnification TEM image of purified SWNTs, in bundles, synthesized by CH4/H2 decomposition at 1000.degree. C. for 6 min, on the supported catalyst SCC81. The catalyst was activated by 4 min of in situ preheating from 25 to 1000.degree. C. in a CH4/H2 flow. FIG. 4a represents the inner and outer diameter distribution histograms of the MWNTs synthesized as in FIG. 3a. The average inner and outer diameter of the MWNTs was found to be 4.7 and 9.7 nm, respectively. No amorphous carbon is noticed either in the sample or on the walls of the tubes. The tubes are generally turbostratic with some defects in the outer surface. FIG. 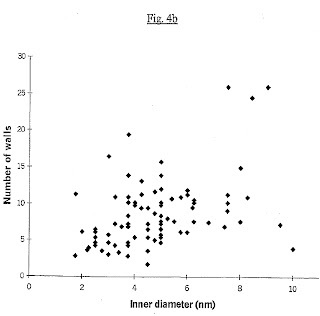 4b represents the number of walls as a function of the inner diameter distribution of the MWNTs synthesized as in FIG. 3a. These MWNTs are obtained by acetylene decomposition at 700.degree. C. in a continuous reaction for 60 min on the supported catalyst SCA2. The supported catalyst was activated by preheating it for 10 min in a flow of N2. The number of walls of the MWNTs is in the range of 2-26 and the average value is 8.